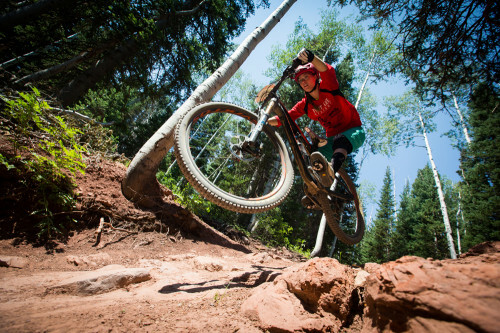 Amanda Cordell is ready to shred the Scott Enduro Cup at the Canyons on August 15, 2015. Photo by Mike Schirf. Salt Lake City, Utah, (August 11, 2015) – The SCOTT Enduro Cup presented by Vittoria mountain bike race series returns to Canyons Resort in Park City, UT, on August 15 for the fourth time and the final stop of the 2015 season. The course map details will be released Aug. 12. Get a sneak peak of the course by viewing Sony's Action Cam “First Look” video here. Registration is still open for all rider categories at endurocupmtb.com. After race stops in Moab, UT, and Sun Valley, ID, the pressure is on athletes to earn final points towards the overall 2015 Enduro Cup championship. The competition is fierce between top-tiered athletes including the current series leaders, SCOTT athlete Teal Stetson-Lee and Vittoria athlete Macky Franklin. Racers will tackle approximately 10 miles of rowdy and sometimes rooty trails over 4,700 vertical descending feet through sharp switchbacks and multiple technical downhills during the timed stages. This year's race will feature longer stages with more downhill than previous years at Canyons Resort. Enduro racing uses a rally-style format with timed descents during competition stages linked together by climbing transfer stages, which are not factored into the overall time. The course at Canyons Resort will pit cardio and strength against nerve and skill. Park City, UT, is the world's first and only International Mountain Biking Association (IMBA) Gold-Level Ride Center accredited for its stunning natural beauty, diverse riding opportunities and successful local mountain bike community. The Open category podium winners receive $2,500 total in prize money divided evenly between men and women. The top placing riders in the Amateur categories receive gear from sponsors. Riders and spectators also have the chance to enter the raffle benefitting the local Mountain Trails Foundation (MTF). MTF is a member-driven, non-profit organization dedicated to building, maintaining and protecting trails for non-motorized recreation is the Park City area. Enduro Cup and MTF are working closely to ensure all trails used for the event will be restored to their original condition. The race starts and finishes at Canyons Village making it easy for friends and fans to cheer for racers and participate in the action. Both spectators and athletes can also view live timing results throughout the race on ItsYourRace.com and the ItsYourRace App. Following the Enduro Cup awards ceremony is the Summer Concert Series at Canyons featuring Grammy Award-winning multi-instrumentalist Sam Bush. The concert is free to the public and all athletes are encouraged to stay, relax and enjoy a concert by this musical legend.